Lou Marini Jr. was born May 13, 1945. According to his biography appearing on Wikipedia, he attended Fairless High School in Navarre, Ohio, where his father (Lou Sr.) was the band director. After he graduated from high school, Lou Jr. attended the University of North Texas where he performed in the One O’Clock Lab Band. Besides the aforementioned groups, Marini has appeared with Eric Clapton, Joe Beck, the Woody Herman Orchestra, Doc Severinson, Frank Zappa, Dr. John, Steely Dan, Maureen McGovern, and toured four times with James Taylor’s Band Of Legends. In addition to being a multi-instrumentalist, Marini is a skilled arranger, composer, educator and producer. His discography consists of a large number of projects spanning a number of musical genres including jazz, rock, blues and classical. 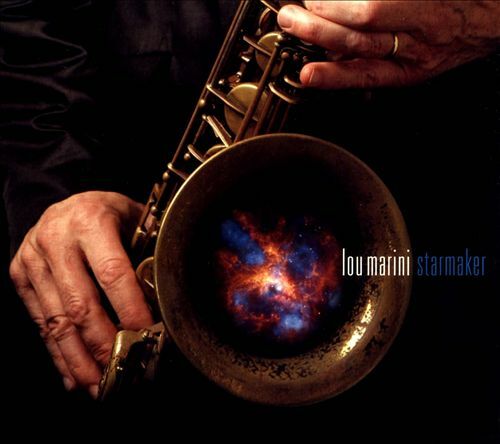 The Lou Marini album I want to discuss this time around is his latest, the just-released jazz CD “Starmaker”. Normally at this point I list the other musicians involved, the sidemen if you will. The problem is, Marini is assisted on this one by no fewer than 17 fellow musicians. Listing that many people and their roles would take almost as long as actually talking about the music, so I’m going to experiment this time with listing the personnel for each track as we go along. I haven’t ever done that before, and I may never do it again. So we’ll see what happens. “Starmaker” brings us eight songs, all Marini originals. The title track is up first, and I have to say that, to the best of my memory, this is the first song I have heard, jazz or otherwise, that was inspired by a science fiction novel. The author of that book, Olaf Stapledon, is not widely known these days because he died in 1950. However, Stapledon’s 1937 novel, “Star Maker”, is still considered a classic of the genre. “Starmaker” the song is a very beautiful piece of music. It starts very quietly with a bit of music that Marini had the engineers record while the rhythm section was basically killing time and unaware they were being recorded. This opening section is very soft and airy, and when Marini comes in with his tenor you might expect it to bring things back to earth but it doesn’t. A couple of minutes into “Starmaker” the opening seems to, in Marini’s words, vaporize, and we are left with a nicely melodic piece of music that is a delight to listen to. That is a good thing, because this is a long song, running a bit over ten minutes. “Starmaker” features Marini (possibly changing from tenor sax to alto and then back to tenor, if my ears aren’t playing tricks on me), drummer Danny Gottlieb, pianist Gil Goldstein, percussionist Manolo Bandrena, Robbie Kondor on the synthesizer, and Bob Crenshaw on bass. The next track is called “Mr. Slinky”. Marini describes this as “6/4 funk and very difficult” to play. It is basically almost eight minutes of variations on the opening three phrases. This is a fairly bold move, and even though the concept may sound boring, the execution is anything but, especially when pianist Gil Goldstein gets his turn in the limelight. I will say “Mr. Slinky” does have a unique sound, quite unlike any song I have heard before. However, neither bold nor different mean it’s bad. Besides Marini, “Mr. Slinky” features Goldstein on piano, Bob Crenshaw on bass, Jeff Mironov on guitar, Manolo Bandrena on percussion, and Danny Gottlieb on drums. Track three is in the style of great, old-fashioned blues. The title, conveniently enough, is “Civilization Blues”. Besides blowing his sax, we get a big dose of Marini’s vocal skills on this one, featuring words written by the ancient Chinese philosopher, Lao Tzu. Thus on one album we have possibly the first-ever jazz song based on a classic science fiction novel and possibly the first-ever blues song based on the writings of a long-dead Chinese philosopher. Those details alone don’t make this album a cut above the rest; it’s the quality of the resulting music that really nails it! “Civilization Blues” begins with a slow, bluesy head and then evolves into first a folksy vocal for Marini and then a harmonious instrumental for everyone. The song bounces from vocal to instrumental a couple of times before fading away. Besides Marini on vocal and sax, we have Goldstein on piano, Mironov on guitar, Kondor on the synthesizer, Bandrena on percussion, and Gottlieb on drums. “In My Dreams” is a modern love song, and has a big vocal component. It opens with Marini singing, “I go driving in my car…” The most prosaic thing of all that modern man can do is drive his car. But who has sung about one? I mean, besides the Beach Boys crooning “She’s real fine, my 409“? Marini’s vocal style fits the subject, sounding exactly like a man who has, to use the vernacular, “Been there, done that” when it comes to having loved and lost. (I hasten to add that I know very little about Marini’s actual personal life, other than what I have read as I researched this article. The conclusions I’m stating here are pure conjecture on my part and could be all hot air. Marini’s voice has the smoothness of a man who has loved, lost, and, eventually, moved on with his life. The pain is behind him, but clearly not forgotten. Skipping ahead, we find a wonderfully gentle ballad called “Mom And Dad”. This was written for Marini’s parents, and as you listen, you can feel the gentle fondness with which he holds their memory. In between the vocal segments the guys take what could have been a maudlin’ memorial and turn it into a nice piece of music with great rhythm and an undeniable sense of nostalgia that has more in common with a celebration of lives lived fully than it does with a lament for those lost forever. The album ends with a reprise of “Starmaker”, albeit a much shorter version than the opening cut. This one trades the ethereal, other-worldly opening of the original for a somewhat similar ending. Which is not to say that there is no sense of flight here, because that, ultimately, is what the song is about, a flight to the stars in search of the star maker. I’ve been lucky enough to be on vacation from my day job this last week. By a happy stroke of good timing, “Starmaker” and another CD both showed up in my mailbox on Monday. Both have been in my 6-disc CD player all week, being, if you will, the background music for my life these last six days. Which is why I can state unequivocally that I am certain you will find Lou Marini’s “Starmaker” to be an exceptional addition to your personal playlist, for a Saturday or any other night! You can read more about Lou Marini, “Starmaker”, and his other music at his web site. You can also “Like” him on Facebook. I just did. Ordinarily I try to embed a few videos from the reviewed album, but because I’m running late with this today I will instead give you the link to Lou Marini’s YouTube channel. I think you find a lot there to enjoy. I am going to go out and get this album! Sounds wonderful.